Wind Resource Assessment: Certain parts of states have greater wind conditions due to elevation, ridgelines, mesas, river valleys and water bodies. Consistent wind speeds ranging from 14 to 22 mph is the target zone for wind development at the hub height of the turbine (120’ to 240’ high). BSW undertakes careful wind measurement and wind source research to determine what the expected power output of each potential site. We will utilize in-house and independent industry specialists to make a final determination. Interconnections to the grid: Small wind projects and distributed wind energy can be established on distribution lines of a grid system, or behind the meter on a site where the power will be used. Avian Issues: Care needs to be taken with the development of a wind project to avoid notable areas of low flight bird migration routes. From time to time, birds collide with buildings, planes, power lines, cars, etc., the turbine could also be another potential obstruction. Environmental Assessment: New land-use activities such as a wind turbine or a wind farm must follow local, state and federal land use guidelines to secure approvals for development. Proximity to special scenic settings, historical conditions, unique plant and animal wildlife along with proximity to residential districts are factors reviewed in an assessment. Access: The site will require a 30 foot road easement to the foundation of the wind turbine. This access point will be used for the lifetime of the turbine to allow for maintenance and repairs. Permits: In suburban or urban settings, a conditional use application will most likely be necessary for a wind turbine or wind farm application. Typically either the proposed use and/or the height of the turbine(s) are contrary to an existing zoning code. In some cases the property may be rezoned to allow for the use to occur. BSW will work with the various local, state and federal agencies to assure that all concerns are addressed. Project Financing: BSW has a strong base of relationships and expertise to readily secure financing for wind projects in the United States and Canada. 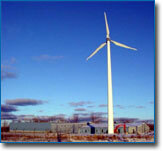 Equipment Procurement: BSW is not affiliated with any wind turbine manufacturer. Based on safety and reliability, BSW will procure the most competitive and technically appropriate wind turbines for each specific assignment. Construction Management: Only construction teams with solid verifiable building records of wind farms will be invited to bid on BSW wind projects. Operations and Maintenance: Once the wind project is completed and fully operational BlueSkyWind will oversee the operations and maintenance services provided by the wind turbine manufacturer. To maximize returns over the life of the project it is critical that the turbine(s) be properly maintained at all times.